With the internet and mobile taking a huge role in the home search process of home buyers, it is important for a real estate company to be in the cutting edge of technology. CENTURY 21 All Islands understands just how important technology is in today’s real estate business and provides their agents with the tools they need to succeed and stay ahead of the game. According to NAR, First-time buyers are more likely to find their real estate agent through a referral. Repeat buyers more often use an agent they previously used to buy or sell a home. However, as the saying goes, out of sight, out of mind. CENTURY 21 All Islands’ CRM platform is designed to automate campaigns such as Property Watch, Market Report, and various Email (DRIP) campaigns – just set it up and forget about it! Our automated marketing campaign system will make sure that you are always in touch with your clients and sphere of influence. We offer a free website to all our agents! Our agent website offers tons of design options coupled with all of the tools you need to create new sales leads and then offer the valued services needed to cultivate them to closing. This includes the MLS search with Google Maps, fully integrated CRM-Lead Management, email Drip Marketing, exclusive Market Watch prospecting system and much more! Every agent website incorporates a fully integrated HTML5 Mobile Website with full MLS search functions. Users can search by MLS number, property type, nearby listings, map location, price and more. Each mobile website is branded to the agent and connected directly to the integrated CRM and Lead Management system. Additionally, Mobile Intranet provides you with direct access to the CRM and Lead Management needs from any mobile device. There is no need to access multiple platforms to manage your online business. - An astonishing 49% of buyers reported that they expect an INSTANT reply from an agent upon inquiry - up nearly five times from 10% in 2007. - When asked what advice Buyers would give their agents to improve their home buying process or level of service, 63% of buyers said “RESPOND FASTER”. When a User inquires about your listing online, our CRM’s “Instant Acceptance” feature will allow you to respond quickly. Instantaneously, the request will be forwarded to your cell and email which will able you to reply expeditiously. We’ve gone Green! We now have a paperless transaction management platform that not only makes keeping track of escrows easier, it also eliminates the need of paper documents. All of your files are instantly accessible anytime, anywhere via mobile. Support is available 24/7. In today's world, a powerful web presence is everything. 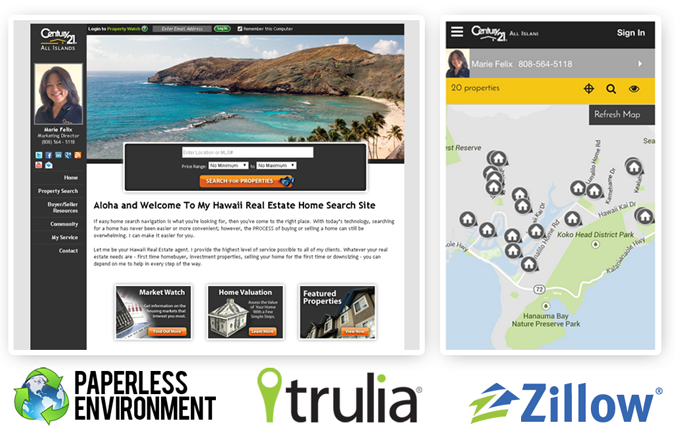 This is why CENTURY 21 All Islands syndicates your listings to over 800 websites including Zillow, Yahoo! Real Estate, Trulia, FrontDoor, and Homes.com.